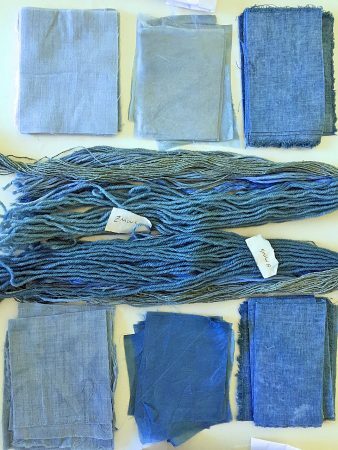 In this session we started sampling adjective dyes, which are dyes that require the use of a mordant, usually alum. 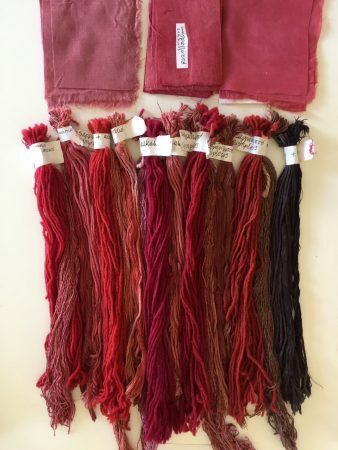 The dyes we used included two of the dyes introduced into Europe at the beginning of the 16th century from South & Central America. They are: Logwood (Haematoxylon campechianum) & Fustic (Chlorophora tinctoria). I had originally planned to use Brazilwood (Caesalpinia echinata), another dye introduced into Europe from South America at the beginning of the 16th century, but this is currently unavailable because it is becoming endangered. So the third dye we used was Sappanwood (Caesalpinia sappan), from India, Malaysia and South-East Asia. Sappanwood is the form of brazilwood known from the 13th century as a red dye in the East, where it was called “brasil” or “bresil”, meaning “glowing like fire”. It was also known in Europe from the late Middle Ages and was imported by the land route. An indication of its importance can be seen by the fact that it gave its name to the country Brazil. When explorers arrived in that part of South America, similar trees were found growing there abundantly, so the country was named terra de brasil after the tree. It gives colours very similar to those from Caesalpinia echinata, but with a slightly pinker tone. Note: for improved colour fastness from logwood on animal fibres, it is advisable to use 24% alum. 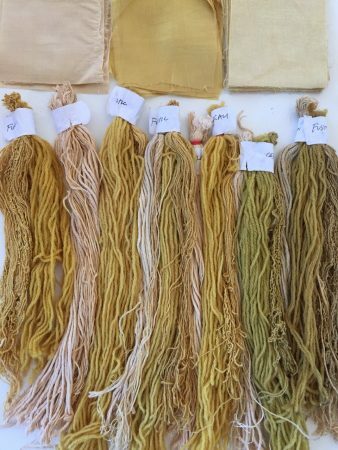 As with the substantive dyes we tested, we applied colour modifiers to the fibres after dyeing. I think 50% logwood was too high a percentage for the colour variations from the modifiers to be clearly visible. We should have used no more than 30% to show the effects of the colour modifiers. I was a little disappointed with the fustic results. 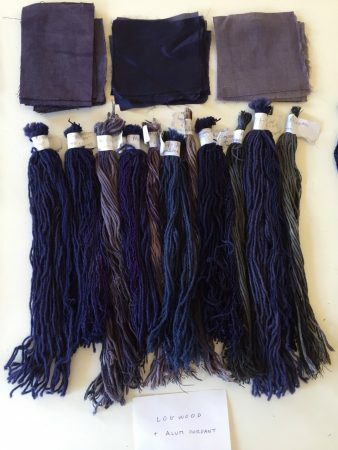 I had expected much stronger colours and I think we probably didn’t simmer the dyestuff long enough to extract all the colour potential. 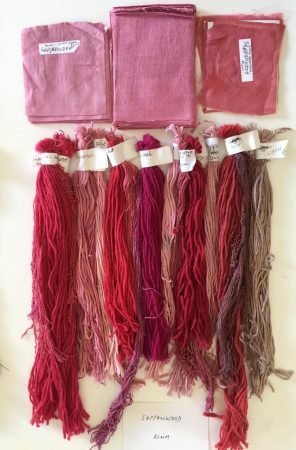 It is always difficult in workshops, when one so frequently seems to be working against the clock, to allow enough time for all the stages and processes involved in natural dyeing. When working at home, it is important to remember that each process needs time and should not be rushed, if one wants the best results. 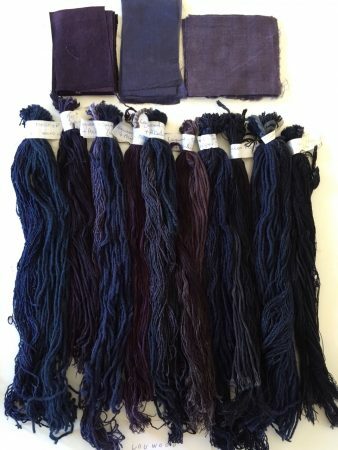 The “look” of the dye bath will often indicate whether more time is needed for colour extraction or colour application and experience is also an important factor. At this session we also made our first indigo vat, using washing soda or wood ash water as the source of alkali and sodium hydrosulphite as the reducing agent. We also made a vat using a stock solution. 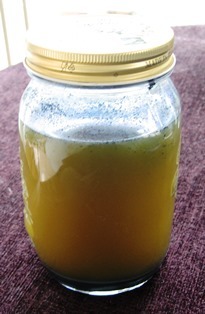 I mixed the indigo powder into a paste with hot water as usual, then added it to about half a litre of wood ash water, which I had first heated to about 50C. I then added sodium hydrosulphite and left the stock solution to reduce. After about an hour, it became a dull yellow-green colour and when I used it to make a vat it worked quite well. 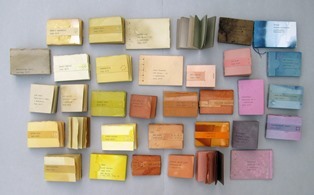 On the “Show & Tell” table this session was a display of the little books made by Helen Gibbs and dyed mainly with various tree barks. 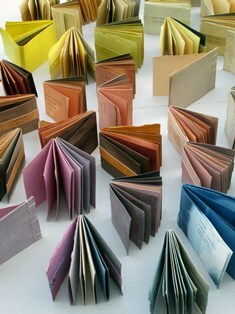 They are really beautiful and just wonderful to touch and open.